Information about the terrorist training camps in northeastern Libya was uncovered after the arrest of several jihadists near the port city of Darnah in early August. Other information about the camps appeared online at jihadist social media outlets around the same time. Two men identified as Tunisians disclosed the existence of the training camps in Benghazi after they were interrogated by a local militia group in northern Libya. At the time of their arrest, the Tunisians stated that they were trained in small arms use and were on their way to join Syria rebels by traveling first to Benghazi, then Istanbul, and over land across Turkey and into northern Syria. According to the officials, the Tunisians were arrested Aug. 3. Inside their car, the militia found six passports, an AK-47 assault rifle, and foreign currency. A total of four people traveling in the car, including two Libyans, clashed with guards at a security checkpoint at the time of the arrest. One of the men said he was an associate of Ansar al-Sharia’s leader Sufian Ben Qumu, an al Qaeda terrorist released from the U.S. prison in Guantanamo Bay, Cuba, in 2007. Details of the number of jihadist training camps and jihadists was not disclosed, but the officials said there are several training camps. The Ansar al-Sharia Brigade in Benghazi was formed in early 2012 from several Islamist militias that fought during the 2011 revolution that ousted Libyan leader Muammar Qaddafi. The group was forced to relocate its operating bases based on local opposition to the group’s role in attacks on the U.S. diplomatic compound. Ansar al-Sharia is engaged in overt charitable activities and armed patrols in Benghazi, in addition to the covert terrorist training. The group has sought to play down its role in jihadist activities to avoid both the Libyan government and international scrutiny. Ansar al-Sharia in Darnah was founded by former members of the terrorist Salim Martyrs Brigade and operates a base west of Darnah. Libyan officials told Britain’s Arabic language newspaper Al Sharq al Awsat earlier this month that some type of covert U.S. military action was taken against al Qaeda bases in Darnah. However, Pentagon spokesmen said they had no information about such attack that reportedly took place Aug. 11. U.S. intelligence agencies believe Libya has produced more jihadist rebels for the Syrian conflict than any other outside nation. Some 20 percent of foreign jihadists in Syria came from Libya and that several hundred are currently in the country. Over 100 Libyans were reported killed in Syrian fighting for such rebel groups as Al-Nusra Front, the Islamic State in Iraq and the Levant, Umma Brigade, Muhajirin Brigade, and Ahrar al-Sham, an Al-Nusra offshoot. The jihadist training highlights the danger that Libya is becoming a breeding ground for al Qaeda terrorists. Officials said the weak central government in Tripoli has allowed Islamist militias to flourish, including in Benghazi and Darnah where the two factions Ansar al-Sharia groups operate. The Ansar al-Sharia Brigade was blamed by U.S. officials for carrying out the deadly Benghazi terrorist attack Sept. 11. The Obama administration sought to cover up the terrorist attack in the weeks before the presidential election by initially claiming the action was the result of a spontaneous demonstration triggered by an anti-Islamic Internet video. Four Americans were killed in the attack, including U.S. Ambassador to Libya Christopher Stevens. A Pentagon report from August 2012 published by the Library of Congress stated that al Qaeda senior leaders and the group al Qaeda in the Islamic Maghreb (AQIM) "have sought to take advantage of the Libyan Revolution to recruit militants and to reinforce their operational capabilities in an attempt to create a safe haven and possibly to extend their area of operations to Libya." The report said al Qaeda is developing a "clandestine network" in Libya that could be used in the future to destabilize the government and offer logistical support for al Qaeda activities in the region. The report said that AQIM has formed sleeper cells that "are probably connected to an al Qaeda underground network in Libya, likely as a way, primarily, to secure the supply of arms for its ongoing jihadist operations in Algeria and the Sahel." "The al Qaeda clandestine network is currently in an expansion phase, running training camps and media campaigns on social-media platforms, such as Facebook and YouTube," the report said. "However it will likely continue to mask its presence under the umbrella of the Libyan Salafist movement, with which it shares a radical ideology and a general intent to implement sharia in Libya and elsewhere." 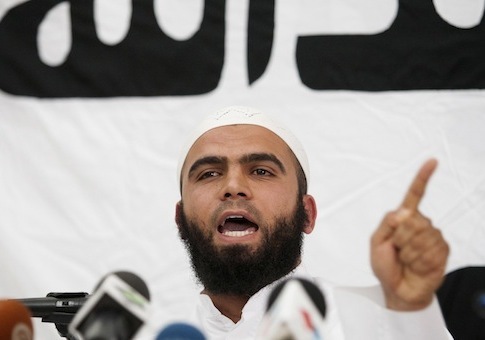 To avoid attacks, Ansar al-Sharia in Libya "could be the new face of al Qaeda in Libya despite its leader’s denial." This entry was posted in Issues and tagged Al Qaeda, Al-Nusra, Middle East, Terrorism. Bookmark the permalink.